← Meal 2: Heart, liver and kidney anyone? 1. Location of power sockets. This seems trivial but is absolutely essential to getting a working kitchen. There is a ‘flow’ to a kitchen and some tasks mean there is a consistent route you end up following. There were two ideas which turned out to be real winners. Firstly, having a socket close to the job. The reason is that we regularly make soups or sauces which are finished with blending using a stick. You don’t want to be carrying a big pan of hot liquid around and worrying where you can put it down. 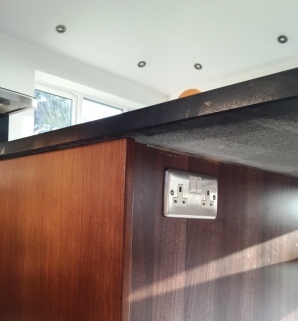 The socket to the side of the hob is one of the most used in the kitchen. The second was to have a power supply in the central island. This tends to be used for ironing more than anything else but it would have been a real pain doing it any other way. In our old kitchen we had a utility sink and some cupboards along one wall. We basically converted this space into floor-to-ceiling cupboards and drawers with a fairly cheap and unobtrusive door and handles set. The designer couldn’t visualise it but we had a good impression in our minds of what it would look like. 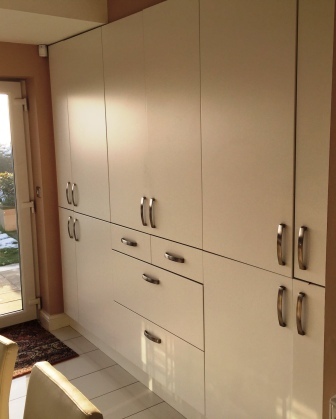 We ended up with loads of storage, by maximising the space available without breaking the modern look of the kitchen. The gallery storage is one of the few gimmicky storage components which really works. I use it for the larder ingredients and as a result the smell of herbs and spices when you open it is one of the little surprises. I am not convinced how space efficient it is but it works for access to lots of little things. It was also very low cost to fit. It is constructed of standard low cost kitchen cabinets with cheap bedroom doors and fittings. 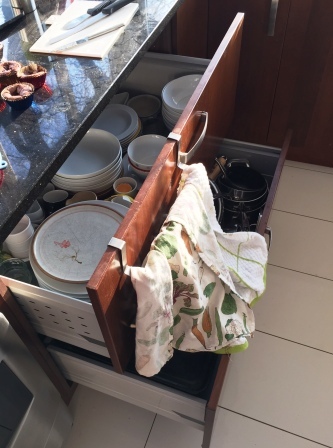 In amongst is our central heating boiler and a second freezer, all the cook books, all the spirits, two crockery sets, a cutlery set, vases…. This is possibly my favourite things of the whole kitchen because it is just so practical and I always wanted a kitchen where there was enough room for everything so that the surfaces (in theory) can stay uncluttered. Related to 2. We saw these put to good use at a friends house while we were still choosing. They are great for swallowing up crockery and food mixer sets. Shelves are not very ergonomic for storing regularly accessed plates and pans. It makes sense to store these heavy items below waist height rather than be reaching up. Again, this was an idea we stole from someone else’s kitchen. It is convenient to have boiling hot water on tap for making hot drinks or starting a boiling water pan. At the same time it removes a kettle from the work surfaces. The only draw back is the cost of water filters for the associated cold tap but it is still a nice addition that we use every day. In the same vein we avoided buying an expensive built in coffee machine because we never met anyone who thought they were a good idea. We wanted light and we wanted a lifestyle from the new kitchen. 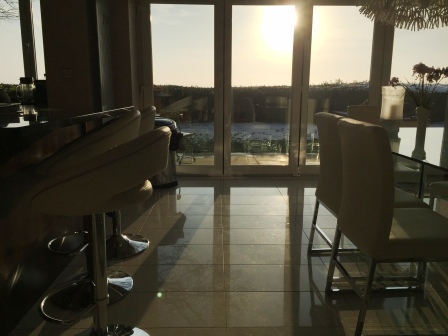 The bi-fold doors allow us to open up the wall in the kitchen out into the garden which gives a lovely open feel. During the summer we have them open for days at a time. For dinner parties in the summer it is lovely to start outside with drinks and nibbles and then bringing the group indoors and closing up the doors as the sun sets. This is a small feature but a crucial one. 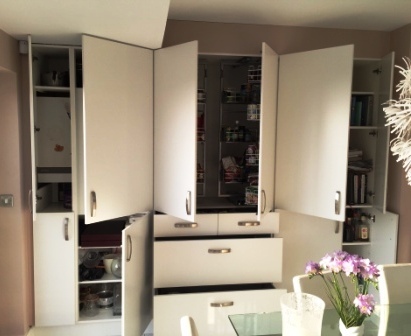 There are windows on two sides but the range cooker needs to be on a solid wall and this results in a corner of the kitchen with storage cupboards. 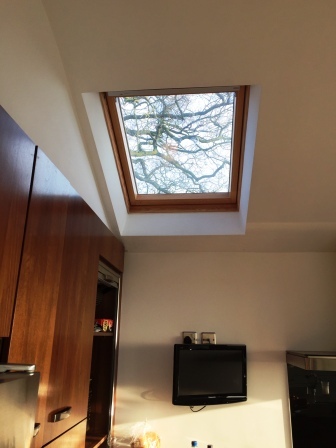 The skylight brings natural daylight into this corner and makes a big difference. We have lots of spotlights (19 lights in total) around the ceiling arranged in five groups each controlled with a dimmer switch. This allows us to change the mood and the focus of the room when we have dinner parties. We’ll start with the hob light and a bank of lights over the island for drinks and snacks and then put the single light on over the dining table when we eat. Finally we will move the group over to the snug with the lighting there and switch off the other lights. In a big room it is a subtle way of creating intimate spaces and a focus. We’ve ended up with a great kitchen which works in the way we intended. Of course we also made some mistakes and some things didn’t quite pan out the way we intended. I’ll talk about those in Part Two. This entry was posted in Articles and tagged architect, bi-fold doors, boiling water tap, dimmers, gallery storage, kitchen design, snug. Bookmark the permalink.